The present is a good time to review both Libbey’s patented Florence pattern and its non-existent offspring, “Florence Star”. Unfortunately, the patented pattern has been poorly treated in the past and misconceptions have grown up around it. Especially irritating is the claim that the pattern gave rise to a second pattern, the so-called Florence Star pattern. Recently Bill Evans has considered both patterns (Evans, 2007). 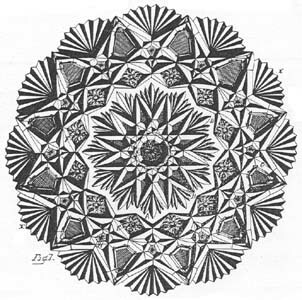 He repeats the often-heard claim that the “Florence Star” pattern/motif is “famous” although “infamous” would be a more appropriate description. 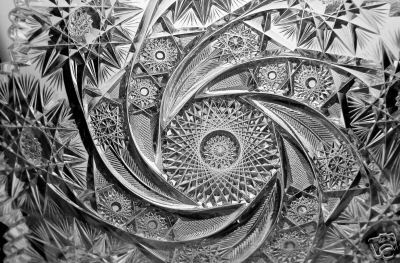 As explained in this file, the “Florence Star” pattern by Libbey never actually existed, except in the minds Bill and Louise Boggess who, in their writings, are not well-known for careful research! Because of the supposed connection of “Florence Star” to Libbey’s Florence pattern, consider first the patented pattern and its design. It is as basic to our discussion as it is to Evans’s. Although Evans writes about the patented pattern, and helpfully gives two examples of how the pattern can vary from the patent depending upon the shape and size of the blank used, he, unfortunately, does not provide an illustration of the complete pattern. It is, however, readily available at the U. S. Patent Office’s Web site. And it is also provided here, on the right, for reference. 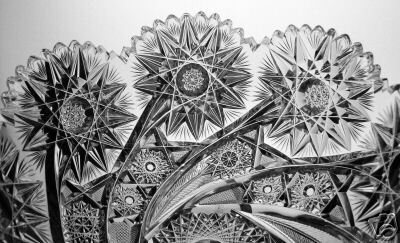 Prints of the patent’s drawing often obscure the cutting that is on the central hobstar’s hobnail. It is, therefore, redrawn here, on the left. Note that this is a 12-pt Brunswick star. The hobstar’s fans on the patent’s drawing are of particular interest because the central ribs are emphasized. However, the writer has never seen this feature on an actual example of the Florence pattern. 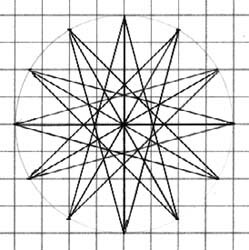 The twelve points of the hobstar are in conformity with the twelve points of the central hobstar as well as the twelve repeats of the following motifs that make up the pattern itself, starting with the motif’s tier that is closest to the central, flashed hobstar: that is, hobstars with plain hobnails that form a chain; and continuing with 5-pt “upside down” hobstars (Evans’s expression) with single stars on the hobstars’ 5-sided hobnails; irregular hexagons containing framed strawberry (fine) diamonds; and fan-scallops at the pattern’s rim. Each motif-set contains the requisite twelve repeats. This design was patented April 23, 1889, by William C. Anderson for Edward D. Libbey, and given patent #19053. The geometric motifs are intricately woven into a complicated pattern not easily remembered except for the large hobstar flashed with fans between the points. As a result, any pattern having the flashed hobstar in strawberry diamond is usually referred to as “Florence” although not identical to the patent and though it incorporates, to a minor, extent, other motifs. In our own experience, we have seen little of the actual standard, the variations being much more common. 1. To the Pearsons the patented Florence pattern is “complicated”; to Evans it is “simple”. 2. Evans does not seem to realize that the flashed hobstar, which he calls “fanned,” forms an important part of the patent. In fact, about one-half of the pattern’s specification is devoted to a detailed description of it. Nevertheless, as Evans reports, not all examples of the authentic Florence pattern include the flashed hobstar, centrally placed. 3. Evans seems to lay the “famous Florence Star” at the feet of the Pearsons. However, note that the Pearsons, in the above quote and elsewhere, never refer to the existence of a “Florence Star.” The most that can be said is that they describe patterns that contain flashed hobstars with strawberry diamonded points as “usually referred to as Florence”, but, more importantly, this assertion is made only in the first of the two books co-authored by them. By the time they had published their second book, four years later, the Pearsons had acquired catalog material that enabled them to drop all references to “Florence” in such circumstances, and to claim, accurately, that many such examples are products of the Meriden Cut Glass Company, a conclusion also recognized by Evans. It was undoubtedly the late Paul Miles who first provided the Boggesses with the correct pattern-name and manufacturer of this item, and they published the correct identification in their third book, using the same photograph that is in their first book. But they do not indicate that this is a correction. For completeness one must mention that Dorothy Daniel was the first writer to publish the Florence pattern’s patent-drawing. It is also of interest that she mentions only one Libbey pattern that is related to the Florence pattern, the seldom-seen Star pattern which also has a flashed hobstar centrally placed (although the drawings of this pattern that this writer has seen do not show strawberry (fine) diamonds on the central hobstar’s points). It is tempting to speculate that the Boggesses simply confused Daniel’s discussion of the Florence and Star patterns, resulting in their fictitious Florence Star pattern. For several reasons, including those given by Evans, Libbey’s Florence pattern is well-worth collecting. Unless the factory had experienced a bad day, one can expect to find a simple or a complex pattern (your choice!) that has been cut on a fine, plain blank (no chance of finding a “figured” blank here). Moreoever, it will have been mechanically polished (no acid). The lack of an acid-etched signature is a plus (it helps keep the asking price reasonable). Also, recognizing it for what it is, one should seldom pass by an opportunity to acquire the fictitious “Florence Star” pattern when it appears as on the bonbon shown in the B1 and B3 books by the Boggesses. This pattern, Hawkes’s Pillars & Star, is at least the equivalent of Libbey’s Florence pattern in quality and rarity even though it seems to have been limited to bonbons. Anyone who has paid a high price for the Boggesses’ “Florence Star” example can rest assured that he or she has acquired a top-notch example of American cut glass from the early brilliant period, even though the pattern was not rated by Pearson in the 1960s and 1970s, probably because it was so seldom seen. Daniel, 1950; Pearson and Pearson, 1965; Pearson and Pearson, 1969; Pearson, 1975; Boggess and Boggess, 1977: AMERICAN BRILLIANT CUT GLASS, Crown Publishers, New York, 183 pp. [B1]; Boggess and Boggess, 1992: COLLECTING AMERICAN BRILLIANT CUT GLASS, Schiffer Publishing Ltd., 272 pp. [B3]; Farrar and Spillman, 1979. Evans, Bill, 2007: Libbey’s “Florence” Pattern, The Hobstar, Vol. 30, No. 3, pp. 4998-9 (November).